I wrote about this house six months ago: a large 1950s Brussels townhouse, built on top of foundations of an older house. It had been divided up into one flat per floor. It is now being knocked into one house again. It has some great upsides: views and a good functional division per floor. Downsides: reduced width, a lot of stairs and an elaborate concrete structure that had to be kept. 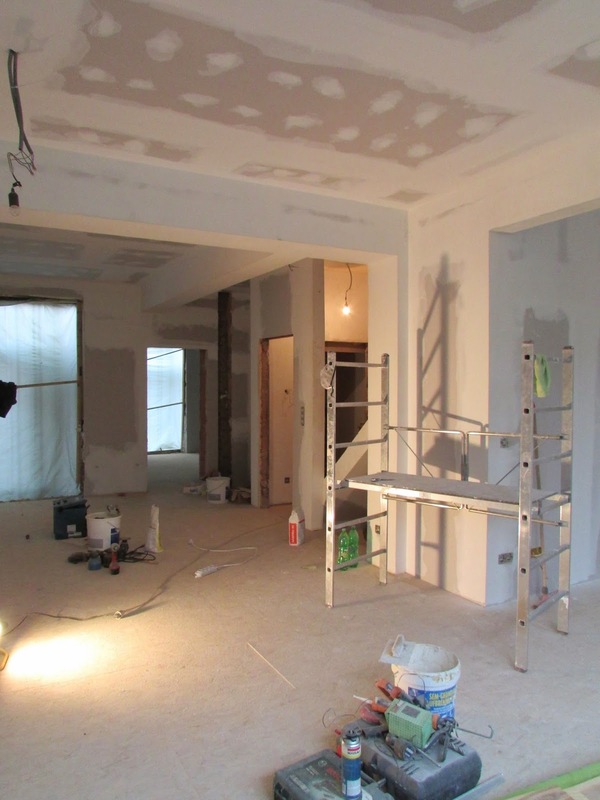 The living area on the first floor is being opened up, with the concrete structures kept visible. This photo shows the same space as the photo above. To the front, the house looks onto a wide street with trees. The windows were replaced, the original subdivision retained. 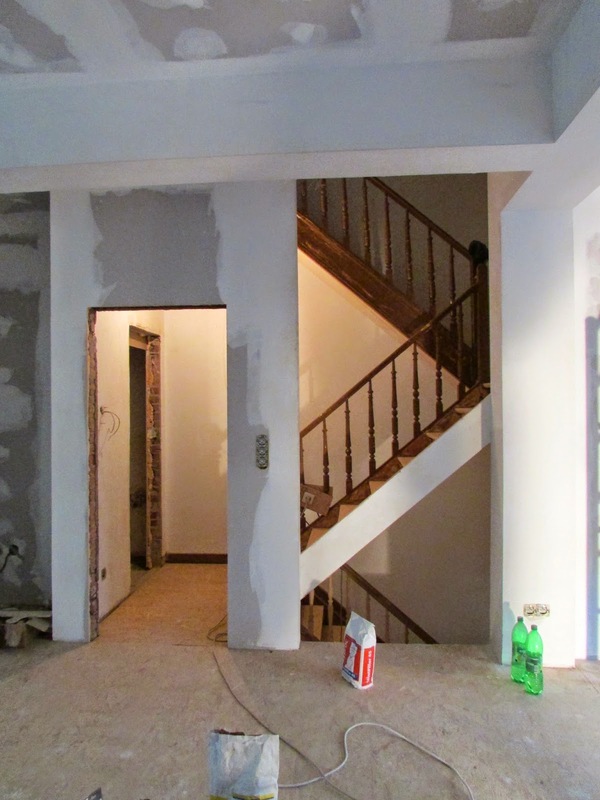 The staircase, behind the door to the left, was a dark and unhappy place. As taking the stairs would be an important routine to the house, it was key to bring daylight to it and make it inviting. 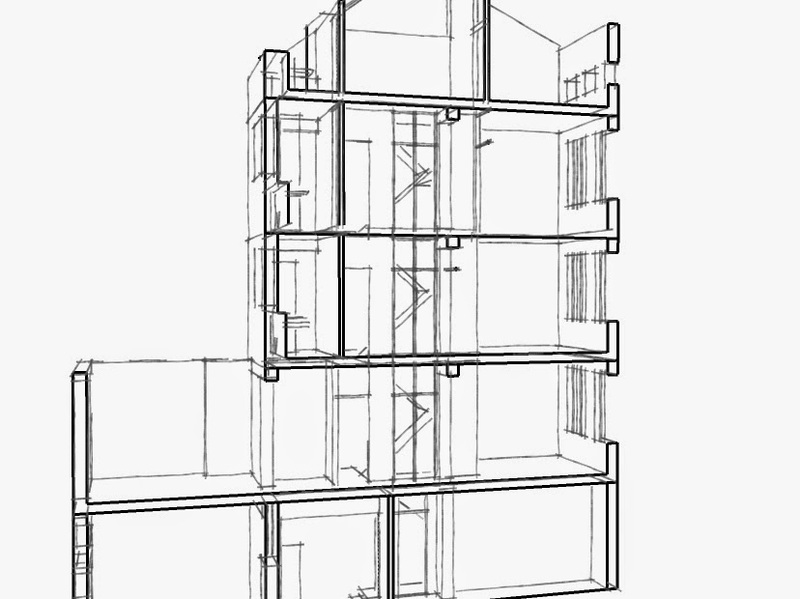 In the section drawing of the house below, I proposed to the clients to make the stairs the visual vertical link in the house. Floor to ceiling windows would replace the walls. They would tie the stairwell to the house and allow for daylight. The visual zig-zag of the sides of the stairs would break up the rigidity of the vertical design. A cut through the house: to the left the garden, to the right the street. Ground level: garage, wardrobe and laundry. First floor: living and kitchen. Second floor: master bedroom and bathroom; third floor kids' rooms and bathroom. Fourth floor (attic): guest room and play room. And this is what you now see when you walk down the stairs. The old hand railings were kept as a nod to the history of the house. 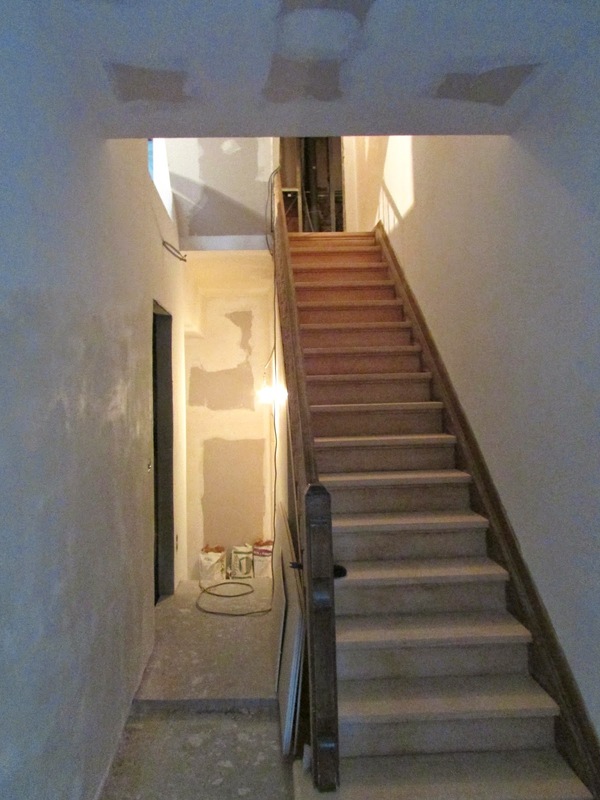 This is the view towards the stairs from the kitchen on the first floor. The metal window frames have yet to be placed. Entrance: I liked the old door, but it made the stairs going up to the house from the ground floor, dingy and uninviting (compounded by the fact that there was no daylight up the stairs). Sadly it had to go. The photo below show the view from the street entrance now.